Vermont lawmakers have spent more than two decades debating how to clean up Lake Champlain and the state's other polluted waterways. Four years ago, they committed to finding a long-term, stable source of funds to get the job done. Two years ago, state Treasurer Beth Pearce offered up a menu of options to do just that. Now, halfway through the 2019 legislative session, lawmakers appear no closer to making a decision. The Vermont Senate is expected to consider a bill this week that would establish a new system for setting priorities and distributing antipollution funds, region by region. But in its current form, the measure includes no new taxes or fees to maintain the full $50 million to $60 million a year necessary to carry out the work. Though legislative leaders claim they'll add a funding source when the legislation reaches the House, environmental advocates aren't holding their breath. "We're really nervous," said Jon Groveman, the policy and water program director for the Vermont Natural Resources Council. To meet water quality goals, lawmakers must find a new source of $10 million to $20 million a year to augment about $40 million in existing state and federal spending. House Speaker Mitzi Johnson (D-South Hero) said she expects the House Ways and Means Committee to propose a funding plan later this session, but the panel has yet to begin crafting a plan. Democrats, meanwhile, have rejected Republican Gov. 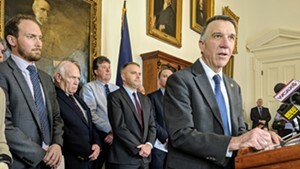 Phil Scott's proposal to use proceeds of the estate tax, about $8 million a year. "Every time there's a step, and there's an opportunity and expectation that money is provided and it's not, it seems like déjà vu all over again," said Groveman, who has been pressing lawmakers to come up with the cash since 2015. "It seems like we've seen this before. Who's going to step up and put the money in?" The problem of polluted waterways is not a small one — or a new one. The U.S. Environmental Protection Agency said in 2016 that the flow of phosphorus to Lake Champlain must be reduced by one-third, or about 200 tons, and to Lake Memphremagog by 29 percent. 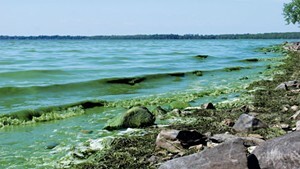 Phosphorus — from cow manure, road runoff, stream-bank erosion and other sources across the landscape — is a nutrient that drives the growth of water weeds, algae and toxic bacteria in water bodies and makes them less suitable for recreation and drinking water. Groveman said the state's past attempts to reduce water pollution relied on policies so weak that funding wasn't the biggest obstacle. "We were failing on all fronts," Groveman said. The 2016 order from the EPA not only made it clear that new policies were needed, Groveman said, but required the state to increase its investment in clean water. So far, he said, "that money has gotten us really dirty water." Pearce's January 2017 report outlined in painstaking detail how the state could ramp up its financial support for the costly changes that are needed to comply with EPA orders and the 2015 Vermont Clean Water Act. 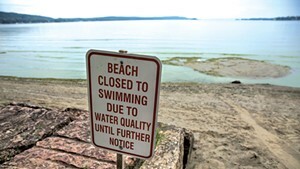 That law gave state agencies expanded power to regulate water quality and called for a range of new permitting systems designed to protect waterways from pollution related to development, agriculture, roadways and other human activity. Scott and the legislature quickly followed Pearce's recommendation to provide a two-year, one-time infusion of $30 million by selling state bonds. The money has helped pay for dozens of projects that contribute a tiny bit to reducing the overall problem. For example, a recent grant helped an Addison County farmer pay for a no-till corn planter because less tillage means less polluted runoff from his fields. Other grants helped reduce runoff from residential properties in Burlington, make improvements to municipal sewage systems and establish erosion controls to reduce runoff from back roads, among other things. But Pearce said the temporary money was intended only to buy lawmakers and state agencies time to establish a long-term funding system for the many years of remaining work. "This does not mean deferring decisions and the resulting actions down the road for another two years," she warned then. In addition to quickly finding a permanent source of new funds, lawmakers should develop a spending model that "maximizes cost efficiency and incentivizes local and regional decision making and implementation," she wrote. Now, just three months before the temporary funds expire, lawmakers are working on a bill that addresses distribution of clean water funds but not how to raise all the needed money. For environmental groups, the year started with a promising sign: After refusing for two years to identify a new, stable tax source to pay for clean water, Scott not only opened the door to new spending — he proposed it. The governor's budget recommendation for next year would steer revenues from the estate tax, collected when the wealthiest Vermonters die, into the state's Clean Water Fund instead of the state's General Fund. "That's positive," Groveman said of Scott's acknowledgment that more dedicated funds are needed. On the other hand, Groveman and other advocates were dismayed by the demise of the only water quality tax considered thus far by lawmakers this year. Senate Natural Resources and Energy Committee chair Chris Bray (D-Addison) proposed to raise $14 million a year with a $40-per-parcel annual fee on every piece of land in Vermont. An additional fee for developed land would have been phased in later to bolster those funds. But Bray couldn't convince the other four members of his committee. The bill, as it emerged from his panel earlier this month, was stripped of all revenue-raising. Instead, it would create a new system for spending money from the Clean Water Fund and to monitor the results of that spending. Under that model, the state Agency of Natural Resources would work with 14 local agencies, such as regional planning commissions, to set local, watershed-specific pollution reduction goals and priorities. The 14 agencies would receive block grants, which they would have discretion to spend on improvements, as long as they met pollution reduction targets and reported their progress to the state. That redesign has won the support of Natural Resources Secretary Julie Moore, who said her agency could use help managing the thousands of potential cleanup projects across the state. "We recognize that we are in some ways a bottleneck in the system," she said. 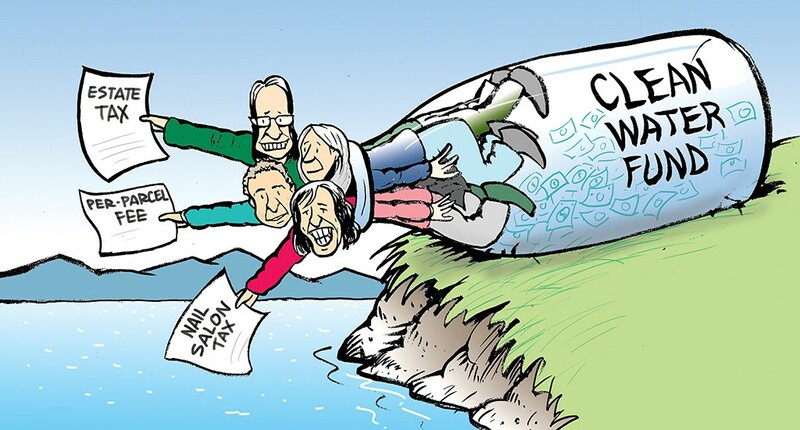 Rebekah Weber, the Conservation Law Foundation's Lake Champlain advocate, called Bray's bill, S.96, "an important step in being transparent and accountable" with clean water money. She said accountability and monitoring are particularly important because the job ahead is so huge. "We need to remove around 213 metric tons of phosphorus from Lake Champlain," Weber said. "That's just Lake Champlain. There are other obligations in other watersheds. We're not near that goal." But she also said there is a major flaw in the plan. "There is no money," Weber said. "We've created some pretty innovative and important structures to get the money out the door, but S.96 does not deliver on money in its current form." To replace the temporary funds and keep the state on track with its clean water obligations under state and federal law, Weber's organization is calling for $25 million in new spending this year. Scott's proposal to use the estate tax would add an estimated $8 million, but it hasn't been well received in the legislature or the environmental community because it would starve the cash-strapped General Fund of that money. Nor did Bray's short-lived per-parcel-fee gain traction, leaving the legislature without an apparent plan to keep paying for the work required by state and federal law. Senate President Pro Tempore Tim Ashe (D/P-Chittenden) said the focus on raising money is misplaced. He emphasized that the targets legislators are trying to meet have to do with water quality, not spending some specified amount of money. "When we arrived here this year, our primary mission was cleaning up the water," he said. "Discussing revenue streams and all that are secondary to the actual policy of cleaning up the water." Still, Ashe said he and his fellow senators "are all committed to the broad contours of an annual effort in the range that was described both by the EPA and by Beth Pearce's report, which was in that 50 to 60 [million dollar] range." Because of the importance of spending clean water money efficiently, Ashe said, it was important to keep Bray's bill on track for passage even without consensus on how to raise that money. "We've got to figure out how to make our annual payment of between $50 and $60 million, but that doesn't have to happen to hold up a bill that's focused on making sure the work projects are prioritized and done the right way," Ashe said. Plus, he said, it takes time to develop sound budgets. "If we don't like the governor's proposal, we have to find the replacement money," he said. "But we don't walk in here with all the solutions just ready." In fact, lawmakers have had access to a list of possible solutions for more than two years. Pearce's January 2017 report listed 64 potential revenue streams to pay for clean water and estimated how much cash each might provide. Her possibilities ranged from a tax on nail salons ($2.23 million in potential revenue) to a $50 per parcel fee ($16.7 million in potential revenue). Every legislative proposal since then has been a variation on one of Pearce's ideas, but none has passed. With S.96 poised to move to the House, environmental groups and senators are looking to that chamber's Ways and Means Committee, which oversees all state revenues, to come up with a plan. 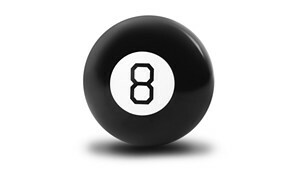 A year ago, Johnson told Seven Days, "We know it's a huge responsibility. Coming up with a new funding source is never easy, particularly when there are a lot of competing needs, but we've got to buckle down sometime." In fact, the House last year passed a measure to raise clean water money with an increased rooms-and-meals tax. The Senate rejected the idea. Johnson noted last week that the legislature has raised some new money for the Clean Water Fund in the past — money that helped the state reach its existing water quality budget. A 2016 addition to the property transfer tax provides $4 million to $6 million a year, she said. Later, lawmakers redirected revenues from unclaimed bottle deposits — about $2 million a year — to the Clean Water Fund. Because of that revenue, Johnson said, the money budgeted for a two-year funding surge is likely to last longer than two years. "We're not at nothing," she said of the funding plan. "We're waiting for the final piece. And while everyone's been sitting around saying, 'Where's the silver bullet? Where's the silver bullet?' we've been quietly saying, 'And here's a piece, and here's a piece, and here's a piece.'" She declined to say what that last piece would be. "I'm very confident," Johnson said, adding that Ways and Means Committee chair Janet Ancel (D-Calais) has said she hopes to propose up to $10 million in new funding — more than Scott's $8 million. Asked whether she has any specific proposals in mind, Ancel said the committee will figure it out in the next few weeks. Groveman remains hopeful that the legislature will fund its obligations before adjournment, but he's not confident. "If history is any indication, we have reason to be concerned," he said. "Because there's no track record of getting over the finish line." Correction, 3/28/19: An earlier version of this story mischaracterized Gov. 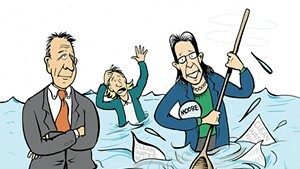 Scott’s previous position on long-term clean water funding.